Borrowdale, a fully rigged wooden sailing ship, was the youngest of the three Storeships or victualler. She was built in Sunderland England for the owners Leightons & Co in 1785, two years before the trip to Botany Bay. Once the decision was made to assemble ships for the journey to Botany Bay, the Navy Board advertised extensively for shipping and accepted the tender submitted by William Richards’s jnr. 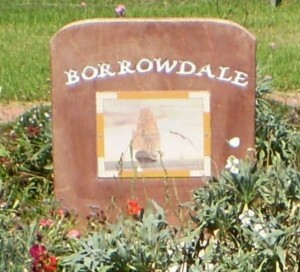 Borrowdale was fitted out as a transport, and for protection 4 guns were installed. She was put under the command of Captain Hobson Reed, Second Mate Richard Williams with a possible crew of 20. On the 13 May 1787 the Borrowdale sailed from the Plymouth with the other vessels of the First Fleet. 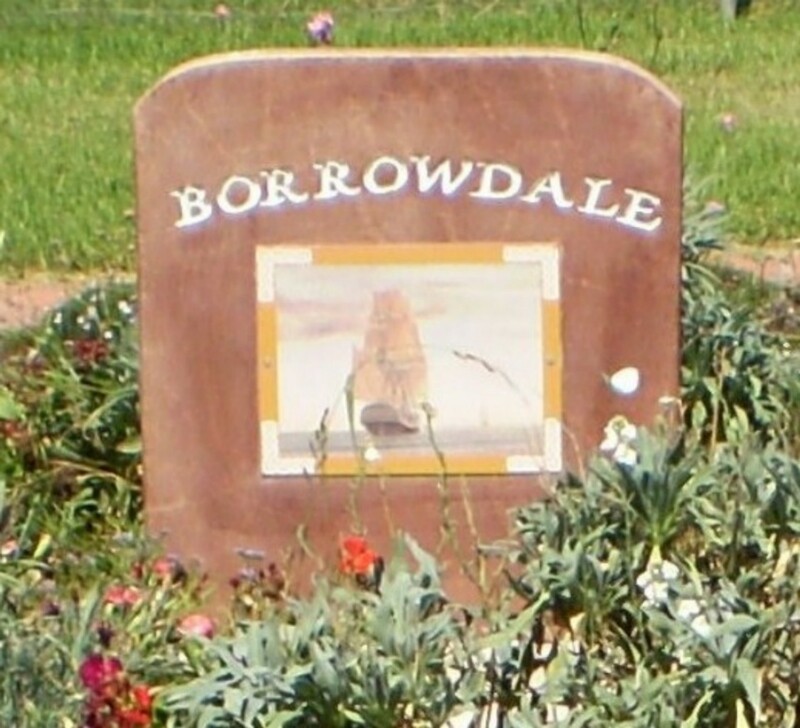 On the long sea voyage Borrowdale lost her foretop-gallant-mast during a gale, she lost one of the ship’s boats near Penguin Island, and had livestock losses. After leaving Cape Town the fleet split with Borrowdale staying with the slower half under the command of John Hunter. The whole fleet was at anchor by 10 o’clock on Sunday 20 January 1788 in Botany Bay. White expressed the general feeling of pleasure and relief. The crew of the Borrowdale was so badly afflicted by scurvy (a shortage of fresh fruits and vegetables) that the master of the ship decided the most prudent course was to break the voyage at Rio de Janiero. Her plight was that bad that on 6 November 1788 the Rio Harbour master boarded the ship with men to carry the crew to the anchoring ground, where several of the men were then taken to hospital. Five of the crew died on the homeward voyage. The ship the Prince of Wales was similarly affected with scurvy and also dropped anchor at Rio. 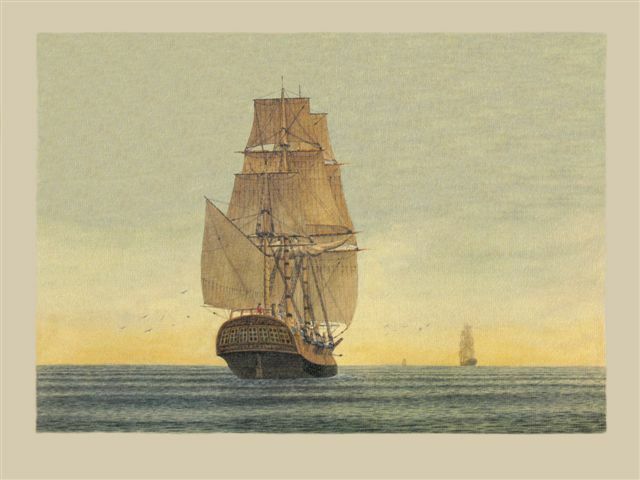 After a voyage of 9 months Borrowdale laid anchor in England on 22 March 1789. Captain Hobson Reed had survived the harrowing homeward voyage, when so many of the crew had suffered from scurvy. Captain Hobson Reed as his will dated 12 December 1786 was proved by his widow on 28 January 1790, so obviously Hobson had died around that time. explorations in various parts of the harbour by boat, and his impressions of the Aborigines. Suffering from scurvy on the homeward voyage Williams was sent to hospital in Rio. He arrived back in England on the Borrowdale in March 1789. May 13, 1787, left England, and arrived at Tenerife, a Spanish Island, June the 3d. Sailed from thence June the 9th, and arrived at Rio Janeiro, a Portuguese Settlement, in the Brazils, South America, the 6th of August. Remained at Rio Janeiro a month, and sailed from thence to the Cape of Good Hope, a Dutch Settlement, which we reached October the 13th. Remained at the Cape a month, and sailed from thence to Botany Bay. Arrived at Botany Bay on Sunday, January 20th 1788. Saw 25 natives ashore on a sandy beach. Sailed from Botany Bay Saturday the 26th, in the morning, and arrived at Port Jackson in the evening, being about the distance of 5 or 6 leagues. Sunday February 3d, the first sermon was preached from the 116 Psalm, verse 12. “What shall I render unto the Lord, for all his benefits towards me?” Saturday the 9th, spoke with two of the natives. Monday, Feb 18, one of the convicts was executed. Tuesday, March 25, spoke with 4 of the natives. Thursday 27th, saw a number of canoes, and spoke with one fishing under a large rock, having a man, a woman, and two children on board. Friday, April 18, in the morning we went up the river about two miles, with our long and small boats. Parted company with our small boats, having on board 5 men, including myself. At a quarter of a mile distant turned a point of land and surprised 4 canoes of the natives, they had a fire ashore, and were enjoying themselves, but on seeing us they immediately fled, leaving behind their canoes, containing fishing implements, a shield made from the bark of a tree, a Calabash shell with food, which was chiefly fish. One of their children we soon overtook, who seemed much affrighted, cried greatly, and began to climb the rocks, &c to escape. Three of the men savages, who were quite naked, returned and sat down with us by the fire for near an hour. The child was about two feet and half high of a chocolate colour, well proportioned, short, black curly hair, ornamented each side of his head with small fish bones, and behind two bunches of white and yellow feathers, from bird called a Cockatoo, cemented to small locks of hair with gum. On Sunday the 27th, went down the river, having the charge of our small boats, with 8 convicts, who went to fish ashore. We put into a bay about two miles and a half from where the ships lay, and spoke with some of the natives, (men) who had three children with them, one of which was an infant, whom I took in my arms. Friday, May 2, one of the convicts was hanged for robbing the ship Charlotte’s tent ashore. Friday, May the 30th, 2 of the convicts were brought into the buildings, who were killed by the natives in the most barbarous manner, by being cut and pierced in various parts of the bodies; it was supposed to have been thro’ revenge for taking away their canoes. Wednesday, June 25, two convicts were executed. Tuesday, March 24, 1789, arrived safe at Plymouth. Richard William’s Journal is a verbatim copy of a reproduction of an original ‘broadside’ held in the Mitchell Library, Sydney. The ‘broadside’ or ‘broadsheet’ took the place of what we know as newspapers. The first newspapers were a luxury because of a heavy stamp-duty tax making them available only to the very wealthy. ‘Broadsides’, so called as they were printed on one side of the sheet only, allowing it to be pasted on the walls of taverns and inns. The subjects were often sensational, murders and tragedies attracted attention, but also popular were ballads and new songs. ‘Broadsides’ were often printed in large numbers, but few have survived, as they were produced as cheaply as possible using the crudest of equipment and presses, on thin fragile paper. THE BORROWDALE SEAL, of Captain Hobson Reed, 1787, a small (44mm x 30mm) hand-made oval fob seal in silver, fitted into a swivelling suspension to enable impressing of seal, with leaf decorated, scroll mounting suspension loop together with fitted screw for securing into rim of seal to stop it swivelling when not in use, obverse of seal features an engraved ship under sail upon waves, below inscribed in running script, `Success to the / Borrowdale’, wreath of leaves around, reverse, inscribed with monogram initials `RH’ (in reverse so they will register HR when used as seal) decorated with sprigs of leaves and around rim with leaf decoration. Discovered in 1999 at an antique jewellery shop in Dorset in the historic Saxon town of Wareham, famous for being the burial place of Lawrence of Arabia. 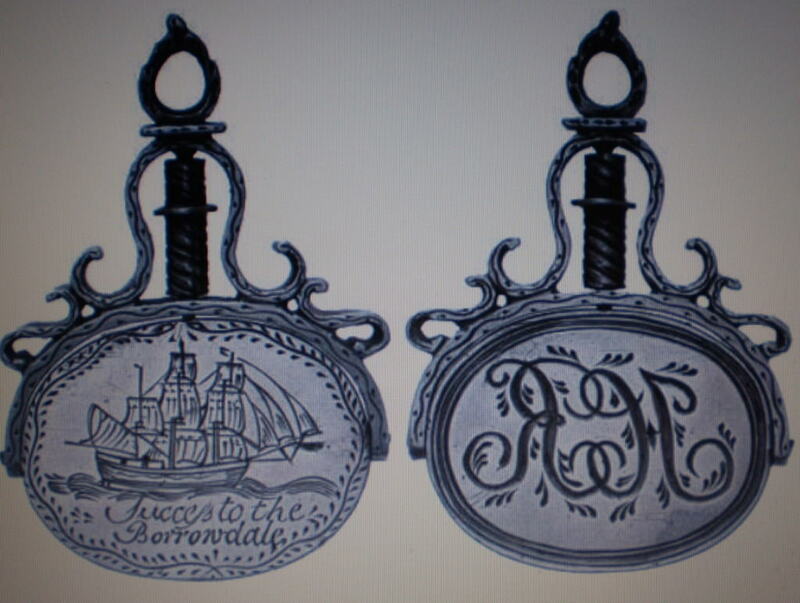 At the time of the First Fleet voyage, in the late eighteenth century, it was not ncommon for new ships and significant voyages to be commemorated with a special item bearing the words ‘success to the (name of the ship). Another coin depicting the convict ship Friendship with similar engravings to the Borrowdale Seal is held by the National Maritime Museum, Greenwich, London (Item No.E4938-1/2). This exhibit features a ship under sail upon waves and below the inscription `Success to the Friendship / 1787′ and on the reverse the initials `FW’ (Francis Walton, Master of the Friendship). Floral decoration also appears on the reverse of this coin and this is a theme which appears on many of the known ‘Success to ..` Commemorative pieces. Being almost identical it is speculative, but probable, that the Borrowdale Seal was commissioned by Hobson Reed’s wife or the ship owners’ as a commemorative of the historic voyage to Australia.